The M21 Class patrol boats are in service with the Royal Thai Navy (RTN). Image: courtesy of Marsun Company Limited. The keel for a M21-class patrol boat being laid at Marsun’s shipyard. Image: courtesy of Marsun Company Limited. The primary missions of M21 boats are maritime patrol and law enforcement, coastal security, prevention of infiltration in sea and coastal zones, as well as protection of commercial shipping, fishing boats, marine resources and coastal areas in gulfs and open sea. The RTN received the first three M21-class patrol boats from Marsun in 2013. It signed a contract with Marsun Company for four more M21-class patrol boats in July 2015. An order for a further two boats was placed later in 2015. The shipyard launched six patrol boats for the RTN in April 2016. In March 2016, Marsun Company was awarded a contract by RTN to build five additional M21-class patrol boats, bringing the total orders of M21 to 14. 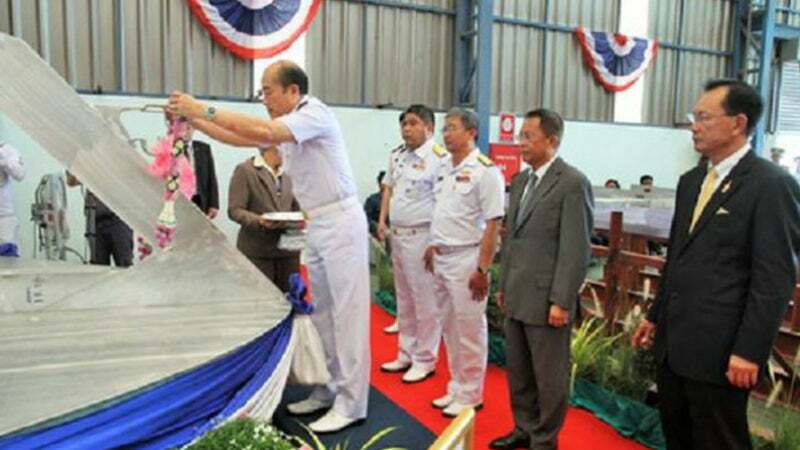 The keel for the first of five M21-class patrol boats was laid down at Marsun’s facility in Mueang Samutprakan in April 2016. Construction on the remaining boats is currently underway at the shipyard. The M21-class patrol boats are mono-hull vessels made of aluminium. The boats feature a stepped superstructure built using aluminium alloys. Designed to deliver superior speed and stability, the vessel has an overall length of 21.4m, beam of 5.56m and hull draft of 1.05m, whereas its displacement is 43t. Each vessel can complement a crew of nine members. The patrol boats are installed with storage tanks to carry 4,000l of fuel and 1,200l of fresh water. They also support the launch and recovery of one rigid hull inflatable boat from the stern side of the hull. The main weapon fitted on the forward bow deck is a Denel GI-2 20mm gun. The duel fed cannon features a hydraulic rearming device and two 150-cartridge boxes on either side of the mount. The gun has a muzzle velocity of 1050m/s and can fire at a rate of 750 rounds a minute. The patrol boats can also be installed with a stern-facing 12.7mm machine gun along with a co-axial 81mm grenade launcher. "The patrol boats can also be installed with a stern-facing 12.7mm machine gun along with a co-axial 81mm grenade launcher." The M21-class patrol boats are equipped with high-frequency single sideband (HF-SSB) and very high-frequency (VHF) / ultra-high frequency (UHF) radios, a global maritime distress and safety system (GMDSS), a satellite emergency position indicating radio-beacon (EPIRB), a search-and-rescue transponder (SART) and a digital selective calling (DSC) system. The onboard navigation systems include a X-band radar, a gyro compass, a speed log, an echo sounder, a differential global positioning system (DGPS), a Navtex receiver and an anemometer. The M21-class is powered by two MAN diesel engines driving two fixed-pitch propellers. Each engine develops a power output of 1,029kW at 2,100rpm. The shipboard electricity is supplied by two 32kWe 220V gen sets. The propulsion system allows the vessels to sail at a maximum speed of more than 30kt. The M21-class can attain a maximum range of 350nmi. Bisalloy Steels is Australia's sole manufacturer of quenched and tempered armour steel plate, as well as high-strength, high-toughness steel plate for naval shipbuilding applications.